Get notified instantly when you receive new leads and messages. Manage client conversations easily from your phone. Request, respond to, and share reviews from past clients. Receive alerts directly to your phone when couples submit a new inquiry or send a message. Stay connected with our best-in-class mobile app for wedding vendors. Respond quickly to client questions directly through the mobile app with easy-to-use templates. Plus, organize your conversations into folders to easily search for past messages. Attract new clients with reviews. Easily collect, manage, and respond to reviews right from your phone to help you build your credibility and get more leads. 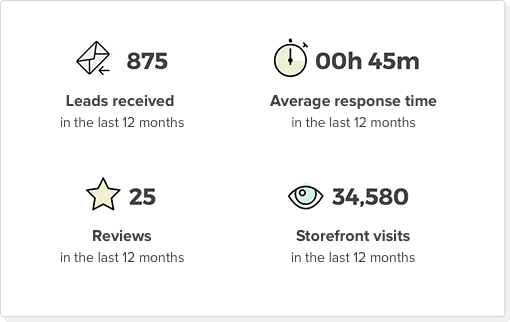 Monitor key metrics including Storefront traffic and leads while you're on-the-go. Optimize your online presence to help you impress potential clients.